Southampton took a huge step towards Premier League safety as they beat relegation rivals Swansea City 1-0 in a winner takes all game, with the result also seeing West Bromwich Albion inevitably drop to the ​Championship. 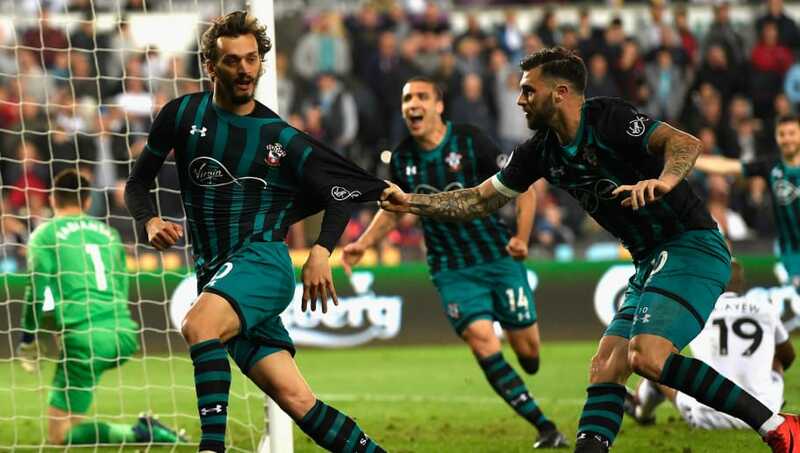 Manolo Gabbiadini was the Saints' hero, as he scored the only goal of the game from close range just five minutes after being substituted on. Both clubs knew that a win in this game would put them in a brilliant position going into the final game of the season on Sunday. The three points for ​Southampton mean that they rise above ​Huddersfield in the table, and avoiding defeat against ​Manchester City on the final day would ensure their Premier League status for another season. With a game of this magnitude, it started just as expected - full of effort and endeavour, but lacking in quality. Both goalkeepers were forced into routine saves in the first ten minutes. But the first opening coming in the 12th min when Jordan Ayew rode challenge of three Southampton players to play the ball to his brother in the Saints area, but Andre Ayew overran the ball - meaning that the defenders were able to get the ball away among feint handball shouts from Swansea fans and players. Possession was exchanging throughout the first half, and on the half an hour mark, it was ​Swansea who gave their opponents a chance when the ball was given away to Nathan Redmond. The England international gave the ball to Charlie Austin, but his 30-yard shot was well wide. The game started to come alive after half an hour, when Southampton had the first real chance of the game. Charlie Austin was played into the right of the box, but his shot towards the far post was dealt with well by Swansea goalkeeper Fabianski. Players now seemed to have found their way into the game after a cagey start, and Swansea came close to taking the lead when Andy King's ball into box from right was flicked towards far post by Sam Clucas, just evading far post. Alex MccCarthy, though, looked to have it covered. With Swansea getting a foothold in the game, they would have been disappointed not to have gone into the half time break with a precious lead. But things could have been different when three minutes before half time, Southampton had arguably their best chance of the half. Cedric's ball was flicked onto Austin whose acrobatic volley was hit well, but flew straight into the hands of a grateful Fabianski. The opening exchanges of the second half were in a similar vein to the first, with most of the action taking place in the middle of the park in a scappy encounter between the two teams fighting for their Premier League lives. Southampton did though have goalkeeper McCarthy to thank for keeping them level, as he was forced into a flying fingertip save to beat away a Jordan Ayew shot that was heading for the top corner. Charlie Austin did have chances for the Saints, but he again found Fabianski in his way, first with a firm shot from just outside the area, and then with a header which was straight at the Polish goalkeeper. Swansea were looking the more dangerous team after boss Carlos Carvalhal made a tactical switch in replacing defender Martin Olsson with striker Tammy Abraham, switching from three to four at the back. But a break in play, took some sting out of the Swansea momentum, as Southampton defender Bednarek was forced off with what looked like a nasty head injury after a collision with his own goalkeeper. The substitution led to the introduction of striker Manolo Gabbiadini in place of the defender, as Mark Hughes looked to find a breakthrough for his team. The tactical switch paid off when Gabbiadini gave Southampton an invaluable lead just five minutes after entering the field. He pounced on the ball to finish from close range after a corner led to Charlie Austin's shot being saved, only for the Italian to rifle to lose ball into the back of the net. He's only just come on and Gabbiadini scrambles the ball in from a corner! Swansea were now pushing for the equaliser that they needed to effectively save theirs and ​West Brom's season in the closing stages of normal time, but their only real chance came from a Abraham header which was tipped over by McCarthy, although the goal wouldn't have counted as the assistant referee's flag was raised. As time ticked away in added time, the Swansea fans started to have a look of resignation on their faces, as they know that they now face a big task in saving themselves during the final game of the season. The same look would have been on the faces of the Baggies following the game, as they seen their time in the ​Premier League ticking away before their eyes. But for Southampton it was a scene of joy as the full time whistle blew, as the players ran over to celebrate with the 2000 travelling fans.